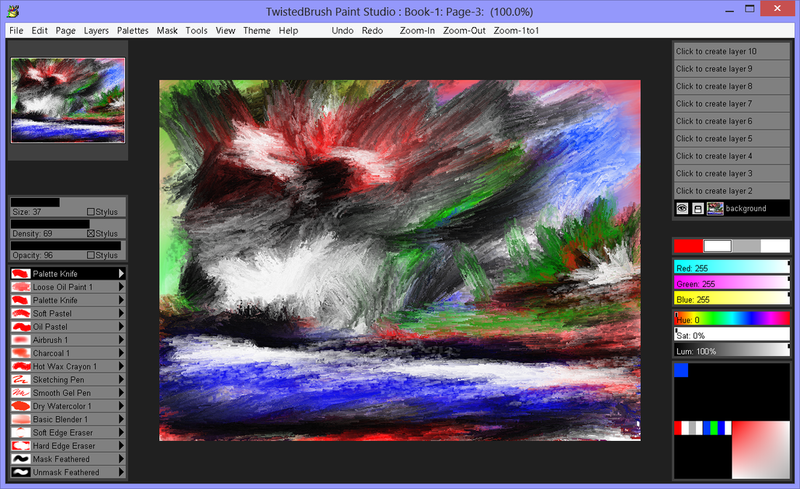 TwistedBrush Paint Studio is a product born from TwistedBrush Pro Studio but with a focus on natural media painting and drawing with a simpler, streamlined interface. Internally the same great TwistedBrush brush engine is used. TwistedBrush Pro Studio is feature packed but if you want a stripped down version for painting and drawing with a new slick interface then Paint Studio is for you. TwistedBrush Paint Studio strips away complexity and what remains is the very best natural media brushes available as well as the key features that have always made TwistedBrush great. Paint Studio includes a selection of the best natural media brush from Pro Studio package for easy access for the digital fine artist. Below is just small sampling of some the brush strokes. The first image shows simple strokes the second shows white paint strokes overlaid on red paint strokes. Paint Studio, as all of Pixarra’s focused Studio products, has a clean interface, designed for an easy, quick workflow. Shown is the dark theme but lighter color themes are also available. On the right are two panels you will use a lot. The Color Management panel and the Brush Shortcut Panel. All the panels in Paint Studio will automatically hide if they get in your way while painting. Manually hiding all panels is also possible with the F3 hotkey. [F4] hotkey. Right click to edit a button or add one to an empty slot. [Ctrl] + click to drag a button to a new location. As an added bonus there is some functionality exposed in the Quick Command panel that isn’t available anywhere else in Paint Studio. different effects that can be combined in 28 effect layers with each effect processed with 100’s of modifiers. I think it’s safe to say the Pixarra brush effects system makes for the most powerful brush engine in existence. Evidenced in the ability with the same engine to draw simple lines or fully detailed tree with a single stroke as can be seen in Tree Studio. One of the common ways to use the Brush Effects panel is to tweak existing brushes in small ways to meet your needs and you can do this right in Paint Studio and save them to the User ArtSets. Easy access support for layers are in Paint Studio. The idea is to keep your workflow simple and fast. A simple single click to create a layer with no scrolling. Right click a layer for additional options. Drag layers to rearrange them. 64 bit color painting system for the smoothest blends available anywhere. World’s most powerful and flexible brush engine with the Pixarra brush effects system Automatic saving multiple copies of your work in progress. Brush compatibility with other Pixarra Studio products. Tracing paper to use as a guide. Up to 9 floating reference Image panels to hold reference photos when working on your art. Sketchbook system that automatically saves your work to your sketchbook. Switching pages in your book with a single key press (Page Up or Page Down). Saving your work to a range of standard image formats. And many more features!